The 2019 Newcastle University Learning and Teaching Conference takes place at the start of April, with the theme “The changing landscape of Higher Education”. We are looking forward to hearing about what has been going on around the University over the past year, as well as disseminating info on some of the projects we’ve been involved with here in the MSP E-Learning Unit. 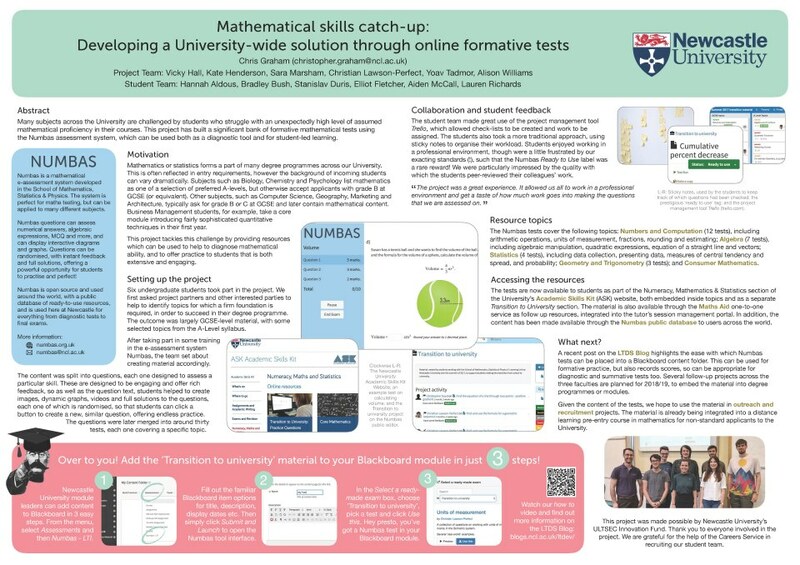 Last year, we were delighted to accept the NUTELA award for best Technology Enhanced Learning submission at the conference, for our poster “Mathematical skills catch-up: Developing a University-wide solution through online formative tests”. The poster described a project, supported by the University Education Development Fund (then ULTSEC Strategic Fund), which was carried out in 2017 to develop online formative Numbas tests for departments outside of our own. If you don’t know about the excellent activities put on by the NUTELA (Newcastle University Teaching Enhanced Learning Advocates) team, then do check out their section of this blog. As part of the award we received a small amount of money from them to support further activities. This was used to help fund a (mainly Yorkshire-wide) tour last summer, where I was involved in talks and workshops at Durham, Sheffield, Sheffield Hallam and Huddersfield, introducing Numbas and promoting the resources we have been creating, which we make available through our public editor and database. Since last summer’s conference, I am delighted to have been invited to also actually be “a NUTELA”, so I look forward to being on the voting/awarding side of the poster presentations this year! I am certain that technology enhanced learning will be a running theme at this year’s learning and teaching conference. I’m pleased to know of at least one submission talking about Numbas applications outside of maths, as well as another poster in the pipeline from our unit (talk about conflict of interest ), this time on the slightly different topic of web-based / accessible lecture notes.